Thousands of Italians have attended a funeral in the Sicilian town of Catania for a policeman killed during a violent riot between football fans on Friday. Mourners clapped as Filippo Raciti's flag-draped coffin was taken into the cathedral square and across the country people observed a minute's silence. The Pope has condemned the post-match clashes between fans and police. In Rome, the sports minister is meeting senior football and Olympic officials to discuss the future of the game. All matches - both domestic and international - were immediately suspended after the death of 38-year-old Mr Raciti. Although he was initially believed to have died when a homemade bomb was hurled into his vehicle, a post-mortem revealed that a blow from a blunt object caused the injuries which killed him. The square in front of Catania cathedral was packed with thousands of people, many of them football fans, who turned out to pay their respects to Mr Raciti. Inside the cathedral it was similarly packed as government ministers joined the slain officer's friends and family for the service which was broadcast live on Italian television. "The minute I heard you were dead I lost the will to live. I don't eat, I don't drink, without you there's no reason to go on. You are the very best father," she said. Overnight, hundreds of people had visited Mr Raciti's coffin at the city's police station. 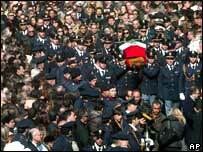 In a letter written to the policeman's family, Italian Prime Minister Romano Prodi said it was "unacceptable that someone should die while carrying out their duty". Mr Prodi is now flying back from Luxembourg for an emergency meeting with football officials on how to counter hooliganism. 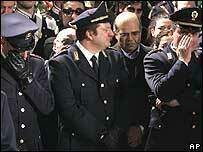 Italy's interior minister, who attended the funeral, warned of an "extraordinary response" to unprecedented violence. Giuliano Amato told La Repubblica newspaper: "The fans are risking the possibility of never seeing football again - of being without football forever, with stadiums empty and barred." On Sunday, the president of the Olympic committee said football clubs that did not respect increased security measures - including closed-circuit television cameras and turnstiles - would not be allowed to host matches. Sports authorities are mulling options including banning the public from matches at stadiums which do not meet recently introduced security criteria and forcing matches to take place behind closed doors. The BBC's Christian Fraser, in Rome, says that as many stadiums are owned by local councils, rather than football clubs, few have been prepared to foot the bill for security improvements. And the president of Italy's Professional Football League Clubs association said matches should be allowed to start again. "Deaths unfortunately form part of this huge movement which is football and which the forces of order are not always able to control," Antonio Matarrese told the La Repubblica newspaper on Monday. "Football should never be stopped. It's the number one rule: football is the industry... do you think there's an industry that would close its factories and not know when they're going to reopen?" "We are touched, but the show must go on," Mr Matarrese was quoted as saying.